I’ve realized I’m always a bit haphazard with polenta amounts when I make it for lunch, because I really love having leftovers. It means I can throw it in a dish to firm up so I can give it a quick fry in the pan and end up with some delicious, crispy polenta. The tuna, cannellini, and tomato combine wonderfully to make for a hearty topping for the crispy polenta. Packed with protein and lots of yummy vitamins, this was a healthy and delicious meal that came together incredibly quickly. Once you have the polenta set, this comes together within half an hour and is super flavorful. As an added bonus, it’s made with ingredients most people have in their pantry. Bring stock to a boil in a medium pot over medium-high heat. Add polenta slowly and stir, whisking continuously until smooth. Season with salt and pepper. Reduce heat to low and cook 35 minutes, whisking frequently, until polenta is smooth and tender. Spray a casserole dish with non-stick cooking spray. Pour polenta into casserole and let come to room temperature. Transfer to refrigerator and let set 6-8 hours minimum (overnight is best). Once set, add canola oil to a 10″ cast iron skillet over medium-high heat. Cut polenta into squares and add to pan. Cook 4-6 minutes per side until golden brown and crispy. Heat olive oil over medium heat. Add onion and garlic and cook until onion is translucent, stirring frequently, about 4-5 minutes. Add remaining ingredients and raise heat to medium-high. Cover and bring to a vigorous simmer. Reduce heat to low, uncover, and keep at a low simmer, stirring frequently, about 20 minutes until tomato sauce has thickened. I apologize for the slow-down in posts this week. I’m finishing up my first set of law school exams on Monday, so I’ve been preoccupied with studying and have been relying mostly on old standbys for dinners. Thus, not too much to report. Today, I decided to spend a little bit of time in the kitchen and wanted to make use of a wonderful present from my future sister-in-law: Mastering the Art of French Cooking by Julia Child. It’s a book I’ve been meaning to buy for awhile now but for some reason never got around to it. It was a perfect gift and I’ll certainly be using it as a source of inspiration and recipes for many years to come. Thanks, Abbie! This dish was healthy, colorful, and packed with flavor. The instructions look like a lot of work, but it was really very easy. 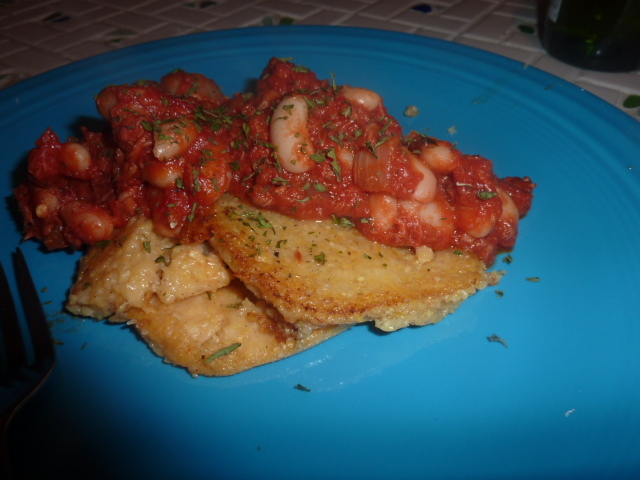 Other than the cooking and chilling of the polenta, this dish came together in 25 minutes or so. I made the polenta yesterday, so there was very little work involved in this dish today. 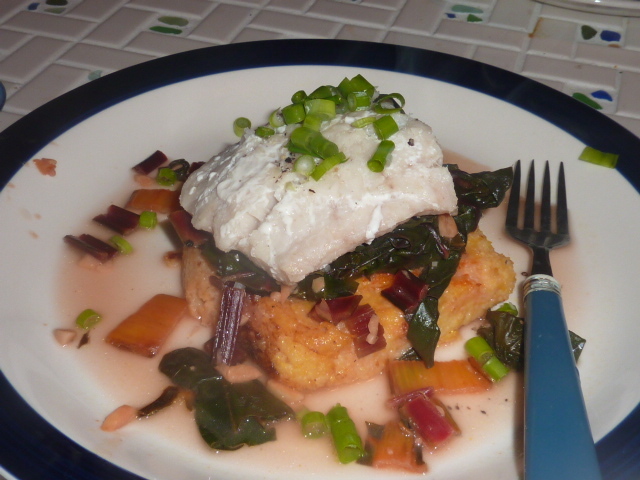 I loved how it had all the classic flavors of a fish fry thanks to the crispy bread-like flavors of the polenta and the bright lemon of the Swiss chard but very little of the cholesterol and fat. Yum! Bring seafood stock to a boil over medium-high heat. Reduce heat to medium-low and slowly whisk in polenta. The mixture should be relatively soupy. Stirring occasionally, let simmer 15-20 minutes until polenta is tender and most of the stock has evaporated/been absorbed. Add 1 tbs. Brummel & Brown, plain Greek yogurt, cheddar and 2 tbs. of hot sauce, whisking constantly. Taste for seasoning and add kosher salt and other ingredients as necessary. Spray a 6″ x 10″ casserole dish with non-stick cooking spray (or whatever size you prefer – the smaller the dish, the longer you will need to chill the polenta). Pour the polenta into the dish and drizzle with remaining tbs. of hot sauce. Let cool to room temperature. Transfer to refrigerator and chill until set, preferably overnight but at least 6-8 hours. In a large sauté pan, heat olive oil and remaining 1 tbs. Brummel & Brown over medium-high heat. Add a 4″ x 4″ slice of polenta and sauté 4-5 minutes per side until light golden brown. Place in preheated 350º oven to keep warm. If you have a sous-chef or don’t mind a mad scramble at the end of a dish coming together, this isn’t necessary. Simply wait until the fish is about to come out of the oven and begin to sauté polenta. Butter a small oven proof cast iron sauce pan with Brummel & Brown. Sprinkle half of the onion whites on the bottom of the dish. Season the fillets lightly with kosher salt and freshly cracked black pepper and arrange them on the bottom of the dish. Sprinkle the fillets with remaining onions and dot with 1 tbs. Brummel & Brown. Pour in the white wine and clam juice. If necessary, add cold water to barely cover. Over low heat, bring liquid to almost a simmer. Poaching liquid should be shimmering but not simmering. Cover sauce pan with buttered waxed paper (I used aluminum foil, which may discolor the wine, but I didn’t have waxed paper. It turned out fine nevertheless.). Place the sauce pan in the bottom third of preheated oven. Poach, maintaining the liquid at a near-simmer, for 8-12 minutes depending on the thickness of the fillets. When cooked, a fork should pierce the flesh easily but the fish should not be dry or overly flaky. Carefully remove the fish from the poaching liquid and place on a covered dish to keep warm. Remove about 1/2 cup of poaching liquid. Place the sauce pan with remaining poaching liquid over medium-high heat and add remaining 1 tbs. Brummel & Brown. Briskly simmer the poaching liquid until reduced by half, about 5 minutes.